Home / Development / Is a PWA Right for Your Ecommerce Business? As an online seller, you know that it’s imperative to stay on top of the latest trends if you want to remain competitive. That can mean many things, of course, from utilizing a new marketing strategy to updating your products themselves. With technology advancing all the time, and with more and more sales completed from mobile devices, it’s a given that your website needs to be optimized for mobile. But do you need to go even a step further than that? 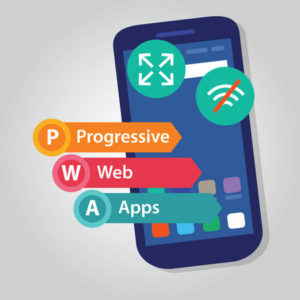 You may have heard reference recently to progressive web apps (PWAs) and how they may impact the ecommerce marketplace. To understand the conversation, though, you have to know what PWAs are. In short, these are web pages specially designed to provide users with app-like experience. They can be reached through a browser just like traditional websites, but they also offer users the option of saving them to their home screen. These sites generally have large, easy to tap buttons, which in effect, just takes mobile optimization to the next level. They also load any cached content instantly, so a poor internet connection won’t impede their performance. Like traditional apps, they allow for push notifications, and they’re specifically designed to allow users to accomplish tasks quickly. Because examples are often better than explanations, take a look at pwa.rocks for a gallery of sample PWAs. If you view them on your phone, then save one to your home screen, you can see how it acts like an app more than a traditional website. It’s easy to see why the smooth, quick shopping experience PWAs provide to your customers would be a benefit, as frustration with a slow or complicated searching or checkout process can lead to lost sales and abandoned carts. But that’s not the only benefit PWAs can provide to your ecommerce business. For instance, having a spot on your customers’ home screens allows for easy access and ensures that you’re never too far from their mind. The use of push notifications has been shown to significantly increase engagement also, with click-through rates markedly higher than those attained through conventional marketing emails. Additionally, PWAs are designed to fit all devices, providing your customers with the same look and feel whether they’re viewing your site on a tablet, smartphone or laptop. That has the dual benefit of helping you build your brand image while also making it easier for your customers to find what they’re looking for. One drawback to PWAs previously was the fact that they were not supported on Apple devices because Safari didn’t have the necessary framework in place. In order for PWAs to work, service workers and web app manifests must both be present, which was not the case in Safari. That omission limited the reach of PWAs significantly, but news has recently appeared indicating that both of these will be in place soon, meaning that they’ll be fully functional on all Apple devices. That’s a significant development, and one good reason to consider investing in the building of a PWA for your ecommerce business. Microsoft Edge is also moving to support PWAs, and so the general trend seems to be for the reach of these types of sites to continue to grow. While PWAs are still not a necessary tool to remain competitive, all signs point to the fact that they will be soon. The bottom line, though, is that PWAs really do provide your customers with a smoother experience that keeps them coming back, and they let you invest in one website to do it all rather than running a traditional website while also investing in a separate mobile app.